Volan glass with 2 inch red resin tint overlap, black resin pigment decor, white resin pinlines. 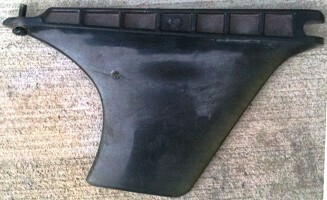 Removable molded fin and fin box. 11'' x 10'' base x 12'' span @ 9 1/4''. Molded with accompanying finbox, design unknown. Unlike the Waveset or Safeset models of the period which fix the fin with a front and rear bolt. This design incorporates a flange in the front of the fin base that locks over a cross-beam inside the box and fixed by a rear bolt. 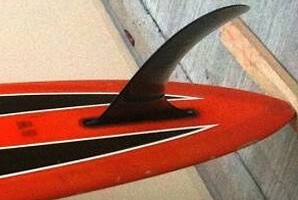 Deck: Gordon Woods Surfboards, black and orange script offset left at tail. PINTAIL, black text on pod, see image below. G W, black text forward of finbox. Clear with 2'' Volan red tint rail laps, white resin pinlines. Bottom : Red tint with black foil pigment decor and white resin pinlines. All board images, dimensions and information provided by Andy Stewart, January 2011. Many thanks to Andy for his contribution. "The previous owner, the bass guitarist and vocalist for SA blues band Hoy-Hoy, had the board from 1977 to 1983. It was then borrowed by the drummer of the Exploding White Mice from 1983 to1992 . The bass guitarist then rediscovered the board whilst at a party and it has lived back with him until 2010 when it was added to my collection." "The previous owner confirmed that he chopped the fin down to allow his son to surf the shorebreak whilst first learning to surf." ""Finbox – Bahne (Fins Unlimited USA) ?? 10 ½” with a 3/8” wooden locking dowl and ¼” cap head locking screw (trailing edge set 9” from the tail). I am fairly certain that the finbox comes from Bahne (Fins unlimited) but confirmation would be fantastic." "I can offer some advice re removal of the fin in your board and that is a full can of CRC / WD-40 or the like applied to the screw in small amounts over a week or so. Should you happen to break the mounting face of the fin identical replicas can be purchased from Mike Jipp at Lincoln City Surf in th USA for around 80$ aus delivered. I know this as I purchased one for this board as the previous owner had chopped the original in half." Note advanced fin placement and highly unusual fin box. Surfing World Volume 12 No. 1 1969.